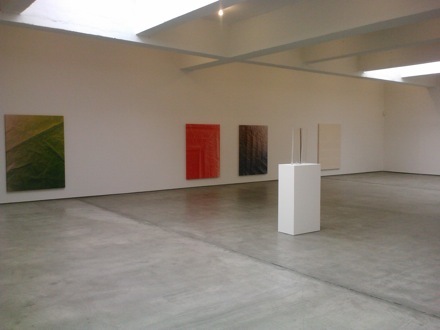 Tauba Auerbach’s first one-person exhibition, Float is on view at Paula Cooper’s Chelsea gallery in New York City through June 9. Included in the show are Auerbach’s signature fold paintings, new monochromatic weavings, and sculptural objects modeled after prismatic crystals, and marbled onyx. Her work is endowed with a general threat to logic, as she strives consistently and elegantly toward the destruction of our limited visual perceptions. 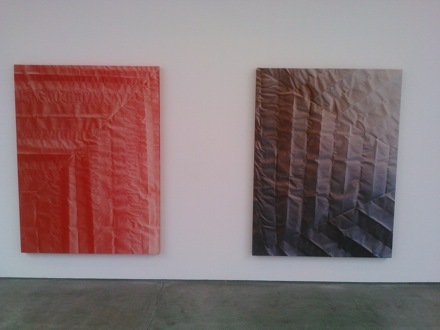 Tauba Auerbach’s Fold paintings at Paula Cooper, New York (2012). 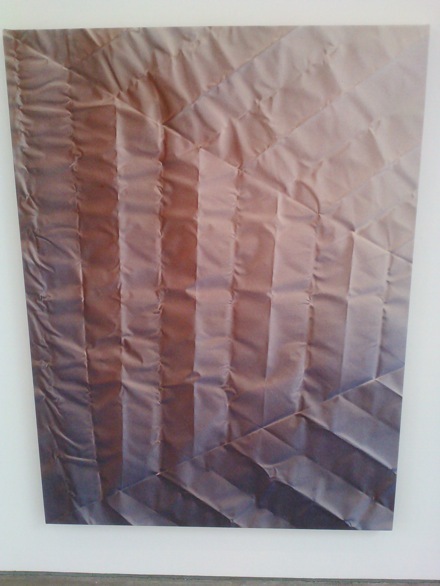 Tauba Auerbach, Untitled (Fold) I (2012). 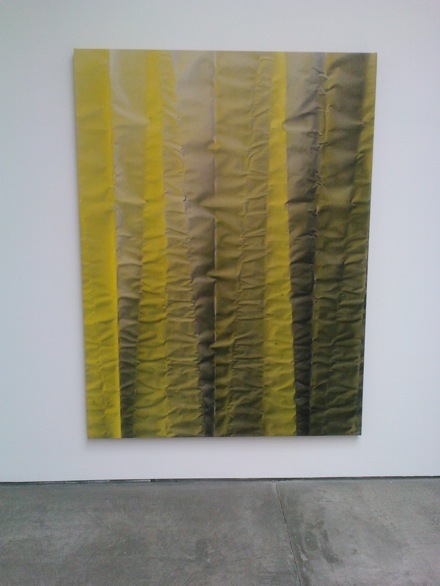 Auerbach began her fold paintings in 2009. Made of acrylic paint applied with an industrial sprayer, these contemporary trompe l’oeil abstractions rely on their creases and permanent impressions left from a disassembled three dimensional shape. The colored gradations achieve a seemingly experiential end, imitating the effect of light on physical dimension. Their saturated luminescence might recall aerial lanscape views, or light deflecting pools or waves. The canvases bare an attention to the organic– light and form– while weaving in the transcendent elements of Auerbachs practice: beauty, perception, awareness, sensitivity. 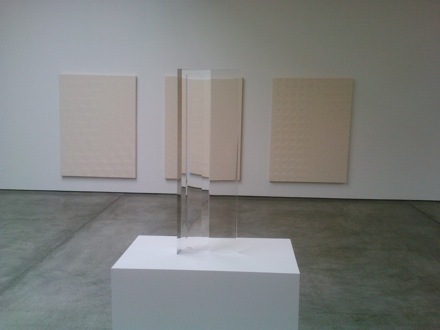 Tauba Auerbach, Slice I (2012). Auerbach’s new series of woven canvas works act on similar principles as the folds, but eliminate color altogether. 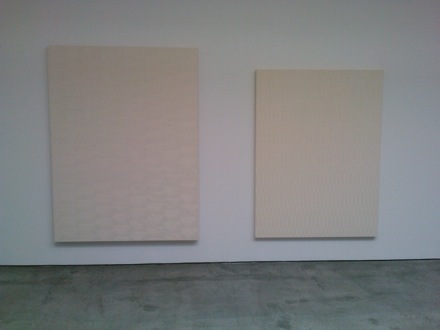 The white monochromes isolate the textural variation and rhythms within the work. The execution is seemingly more technically deliberate and planned, as opposed to the more experimental interaction of pigments in her paintings. Furthermore, Auerbach does not repeat a single woven pattern, but fuses multiple patterns in a relational network. 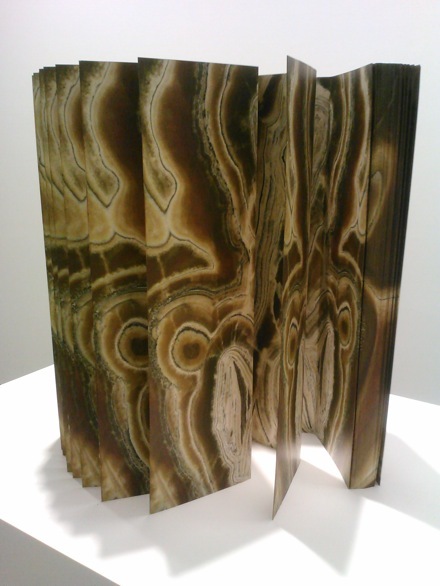 Tauba Auerbach, Bent Onyx (2012). 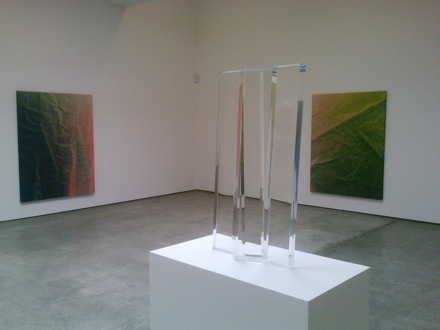 Tauba Auerbach, Double Prism II (2012). Auerbach’s sculptural works include a bound stack of paper modeled after a block of onyx, and a clear prism of lead crystal and urethane resin. Of the onyx sculpture, Auerbach explains that she is, “allowing the viewer to slice through a solid block of onyx layer by layer, revealing the twists and turns of a mineral narrative.” In a similar way, the prism piece may at any point slice through the other works on view if seen from behind this work, which is mounted atop a white pedastil in the center of the main gallery. 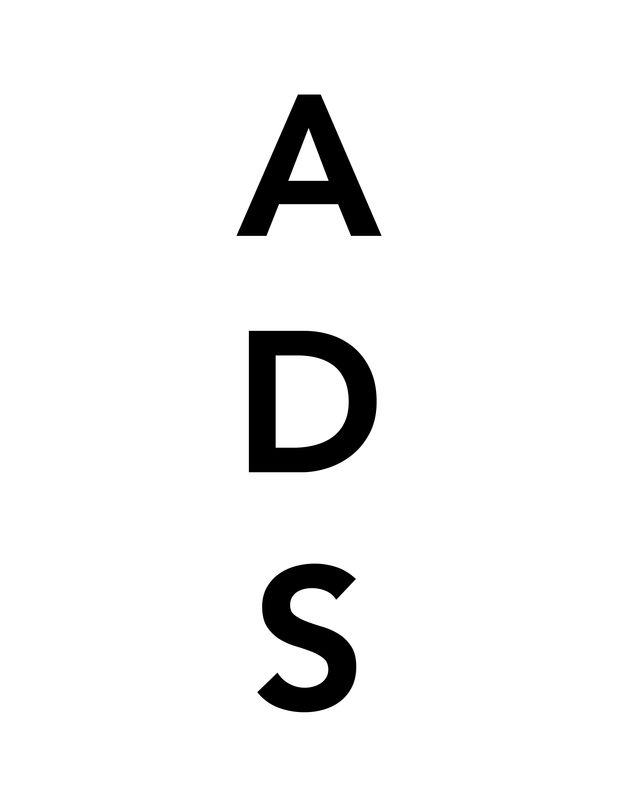 This entry was posted on Saturday, June 2nd, 2012 at 12:10 am	and is filed under Art News. You can follow any responses to this entry through the RSS 2.0 feed. You can leave a response, or trackback from your own site.